The Funky Monkeys, frmo left, Craig 'Skippy' Goodfellow, Craig Hall, Ross Goodfellow, Chris Gillan,Craig Thomson and Barry Melrose. 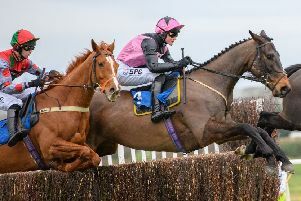 Borders-based members of the Owners Group Syndicate, who were unable to make the annual trip to Gloucestershire this year – or prefer to stay home for the big occasion – had a memorable day out on Saturday in celebration of the Cheltenham Festival. Around 30 local members of the Syndicate, who are part of a 3000-strong group from across the country, either horse owners or shareholders, met up for lunch before heading for the Canon Bar in Jedburgh to follow the action. John Szcudro, Kenny Oliver, David Easton, Greg Blair and Jimmy Raeburn settling down to watch their horses racing at Cheltenham. In a tradition started years ago by the late Jed Renilson, they have a runner to the bookies and choose a different dress code each year. For 2019, the required garb consisted of a blue shirt, tartan tie, waistcoat and ‘bunnet’. Members make a one-off payment each year, with no other costs, and are kept informed of the progress of horses in which they may have an interest, or shares. It was summed up by one local enthusiast as “a very cheap way of being involved in horse racing”. Happy members of the Owners Group Syndicate (pictured by Bill McBurnie). Costumed racegoers in 2019's choice of blue shirt, waistcoat, tartan tie and cap.